Daniel Fierer, 2014 NBBC winner, awards PHC scholarships to 2018 Senior finalists. The tenth anniversary of the National Bible Bee witnessed God’s faithfulness as thousands of students proclaimed Scripture over the summer. In December, that provision continued at the National Bible Bee Competition, showcasing young people from across the nation with one goal in mind: to know God’s Word and make Him known. 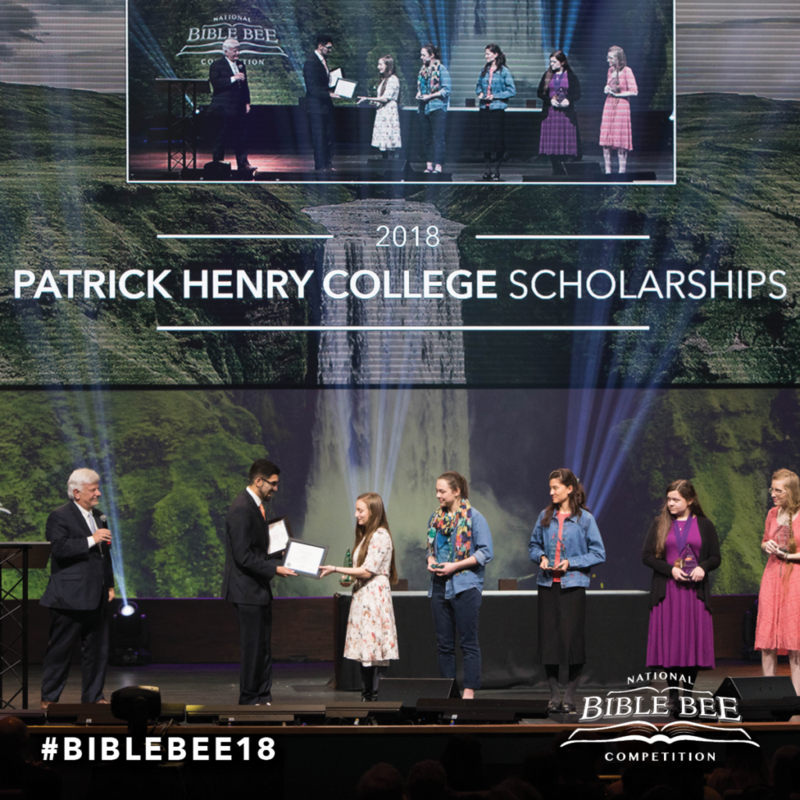 This year, Junior and Senior finalists of the National Bible Bee Competition walked away with gifts from Patrick Henry College, ranging from scholarships for their tuition to the summer camp they offer each year. First place in Senior was awarded $60,000 scholarship to Patrick Henry College, second place was given $40,000 and third through fifth were awarded $20,000 each. Patrick Henry College was founded in 2000 with a vision to restore America by educating the best and brightest Christian students to take their place as future leaders of the nation and its culture. Its mission is to prepare Christian men and women who will lead our nation and shape our culture with timeless biblical values and fidelity to the spirit of the American Founding. Patrick Henry College believes that God is the source of all truth, be it spiritual, moral, philosophical, or scientific. For this reason, they seek to educate students in God’s truth throughout the entire curriculum. It enriches my spirit to see the Word proclaimed by our youth! I get so much joy from watching the recitations. There is little else that our students could commit themselves to doing with excellence that has more lasting value and true significance. We are thrilled and honored to partner with the National Bible Bee. We pray God’s continued blessing for you!